The epic adventure starring Donnie Yen, Jackie Chan, and Bing Bing Fan is coming to Blu-ray in March. 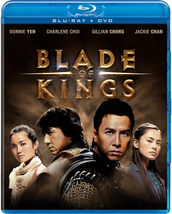 In an early announcement to retailers, Well Go USA is prepping 'Blade of Kings' for a Blu-ray release on March 6. The all-star cast also includes Charlene Choi ('Triple Tap,' 'The Jade and the Pearl'), Gillian Chung ('Vampire Effect'), and Hong Kong Film Award nominee for Best Newcomer Jaycee Chan ('1911') in the tale of a humble boy born to rule an empire who must first undertake his journey to claim his throne in the mythical land of Huadu. Nominated for four Hong Kong Film Awards, including Best Visual Effects, the film was directed by Patrick Leung and Cory Yuen. Specs have yet to be revealed, but the release will be a Blu-ray/DVD combo pack and supplements will include the behind-the-scenes featurette “The Making of Blade of Kings” and a music video. You can find the latest specs for 'Blade of Kings' linked from our Blu-ray Release Schedule, where it's indexed under March 6.